The dancing flames of candles have been used as a Witches' tool for centuries. By setting the proper atmosphere, candles are used to help increase a spell's power, or to influence a particular power. 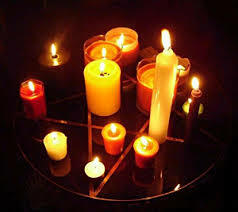 Candles absorb one's personal energy and release this energy when burned Candle colour is very important when performing magick, for each colour emits a particular vibration and attracts certain influences. The candles used in these spells have everything needed to charge and dress the candle. Each spell is made for the specific person at time of ordering, the oils and instructions are provided. Candle magick is probably the oldest and simplest form of ritual magick still performed today. Ever since fire was discovered, the naked flame has been regarded as sacred. In ancient times they used to light touches to invoke the Goddess and Gods. Today we symbolize those acts by utilizing candles. The naked flame remains the finest and easiest means of focusing in on power and energy.